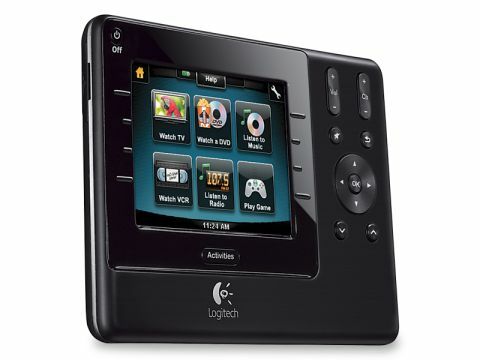 Logitech's range of universal remote controls has been so well-received by the home cinema enthusiast market that the company has rapidly become the number one brand for programmable clickers. And with the high-end Harmony 1100 it's easy to see why. With its gloss black styling and 3.5in colour screen, it's an exact replacement for the extremely popular Harmony 1000. The 1100 is similarly capable of controlling up to 15 separate items of kit (via IR or, with an optional extender, RF). Of course, you'll need to hook up the remote to your computer and, subsequently, the internet, which may put off some, but the supplied software is so simple to use, that it shouldn't take more than an hour to set up. And that includes macros (called 'Activities' here), too. The software, onscreen graphics and button layout have all been improved over the Harmony 1000 thanks to consumer feedback. The ability to set up Activities (sequences of events that switch on all of the relevant equipment) is a godsend. For example, tap 'Watch TV' and the screen, Freeview box and amp all start up automatically. It's not the biggest leap in tech over the less expensive 1000 and the RF control is only available as an extra. But that's nitpicking really.